Because language is a system of communication, it is useful to compare it with other systems of communication. For instance, humans communicate not just through language but through such means as gesture, art, dress, and music. Although some argue that higher primates such as chimpanzees possess the equivalent of human language, most animals have their own systems of communication: dogs exhibit submission by lowering their heads and tails; bees, in contrast, dance. For example, when a honeybee finds a source of nectar and returns to the beehive, it can perform a complex dance routine to communicate to the other bees the location of this nectar. Depending on the type of dance (round dance for nearby and tail-wagging dance, with variable tempo, for further away and how far), the other bees can work out where this newly discovered feast can be found. 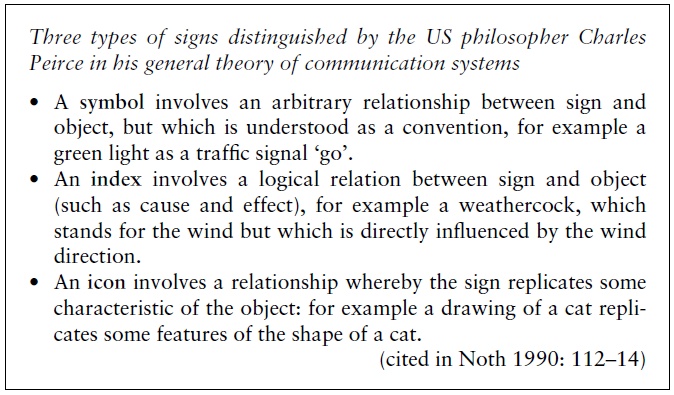 The symbols are arbitrary in the sense that the link between the sound and the meaning system varies from language to language. There is no necessary connection between the form of a word and its meaning. For example, the term ‘cat’ in English refers to a particular animal by convention, not by a special connection between the sequence c-a-t and the animal. Of course, cats are referred to by other sound (or words) in other languages, for example billıˉ in Hindi. An exception is formed by words which do reflect some property of the concept which they denote. In literary analysis, these are described as onomatopoeic, as in the word buzz, which to some extent mimics the sound made by bees (see the term ‘icon’ in the box below). The arbitrariness of linguistic symbols was stressed by the Swiss linguist, Ferdinand de Saussure, who differentiated between the ‘signifier’ (the word for a concept) and the ‘signified’ (the concept denoted by the word). These were two indistinguishable aspects of what he called the ‘linguistic sign’.